We’ve all had them…those Aha moments when you realize something profound that impacts your life like nothing else. When I realized I was sensitive to grains and sugar it was an Aha moment for me. Most recently though was the realization that I needed to embrace the entire process of eating…from planning, shopping for ingredients, preparing meals, and sitting down and enjoying my meals. I never did that before. I never made time to plan my meals and hated going to the grocery store. Preparing meals was always a challenge because I either didn’t have all the ingredients I needed (due to my poor planning!) or couldn’t find things in my kitchen to use in cooking. And eating meals was always rushed because I was always focused on what I had to do after I got done eating. Sound familiar? Over the past month things started changing and I finally looked at all the obstacles (excuses) and resolved to correct them. And the number one obstacle? I needed to start tracking my calories and had every excuse under the sun as to why I couldn’t. You see, I never had to track before. Losing weight in the beginning was a piece of cake…I lost 10-15 pounds a month seemingly effortlessly by eliminating grains, sugar and processed food from my diet. I was so happy that I didn’t have to track my calories. But circumstances change and now I need to change. Tracking my daily calories keeps me accountable! 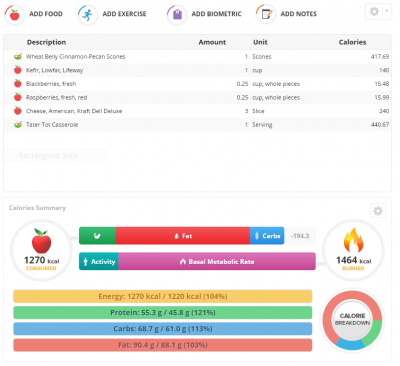 I use Crono-o-meter online to track my daily calories, input new foods and create new recipes. They offer both a Free Edition and a Gold Edition. Their database is huge and if something is not listed it is easy to add custom foods and easier to create your own recipes. I aim for 1200 calories a day but often go over. 1200 calories a day is NOT a lot of food! Tracking, like blogging, keeps me accountable and on focus. So I learned to enjoy this part of the process instead of hating it. It’s all about attitude and I realized that with the right attitude I can accomplish my goals…I can accomplish anything! Tomorrow I will be sharing a recipe that my grandmother used to make…Tater-Tot Casserole! Posted on March 13, 2015, in New, Resources, Tracking and tagged calories, Goals, obstacles, tracking. Bookmark the permalink. Leave a comment.